Before you (my non-Malaysian friends and readers) ask, it's a fried chicken dish which we called "Ayam Penyet", literally translated as "Smashed or Pressed Chicken", because the chicken is smashed or pressed to make it soft before it is fried. It's my second time I am having this Ayam Penyet because it's SO DELICIOUS!!! Well, I bought it from the Ramadan bazaar @ Section 14, PJ. According to the owner of the stall, it's marinated for a few hours in a blend of spices, then half-boiled and fried to certain crispiness. Now how yummy could that be! Hmmm, does anyone have any good recommendations on where to go eat Ayam Penyet besides this? I've not tried this type before but it sure looks divine...and spicy! The one I recommended, is yummy too and so far, I've had it thrice hohohoh!!! He he actually B likes the ayam penyet, I usually take the prawns! 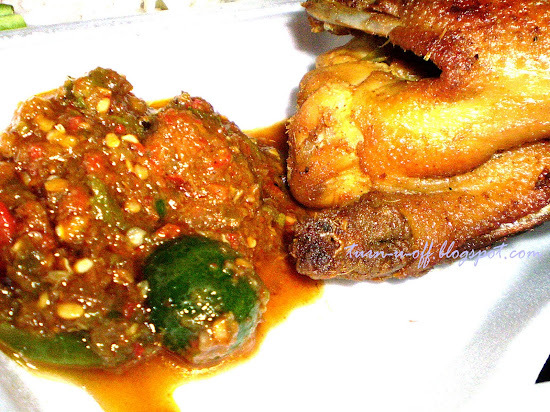 I wan to try this one too, the sambal looks delish! I still haven finished dropping for WOAFS huhuhu! 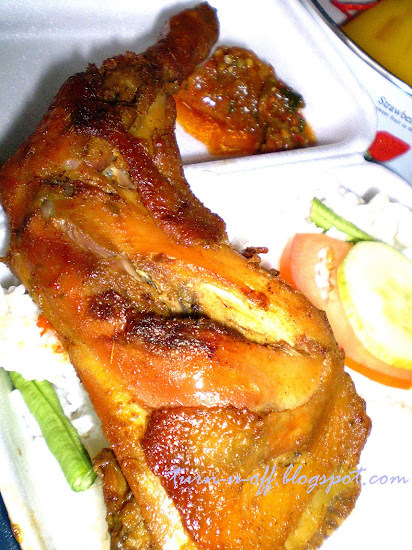 Recent blog:=- off the path..
Wahhhhh even more enticed with the very hot sambal yowzaaaa! LOL haven started at all? I haven started my translasi oh no…. That chicken is making me hungry. I haven't tried Malaysian dish, it's time I try it. Ehh Mon.. Ayam Penyet or Ayam Penyek? I almost zzzzz la then my phone rang and now I cant go back to zzzz, aiya! you're making me so hungry Mon. Blazing hot? My son would love this!!!! There is a restaurant at sunway (beside Picaso Wedding shop) very famous for 'ayam penyet'. tried before, not bad. Its indonesia cuisine. I like ayam penyet too, especially the sambal! So yummy!